42 of Wisconsin's 45 points have come from the starters. 34 of the 42 starter's points from seniors. #Badgers trailing 50-47 with 7:05 left. Hayes with 14 points to lead UW. #Badgers in big foul trouble but within 50-47 and have ball OB with 7:05 left. Happ and Hayes are 6-for-10 in the second half. Everybody else is 1-for-6. UW trails 50-47 with 7:05 remaining. 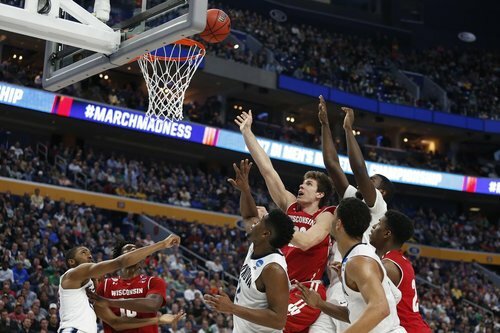 Wisconsin down 50-47 with 7:05 left. #Badgers trail Nova 50-47 with 7:05 to play. Nigel Hayes keeping UW in it. Ball out of bounds off Villanova. #Badgers will inbound after the timeout. Hayes up to 14 points, 6 rebounds. No Koenig out of the break. 'Nova 12/15 from the line. Badgers 5/12 after Hayes goes one-for-two. Koenig back in with 5:43 left. #Badgers 19-25 from line on Thursday. Today: 5-12. Brutal. 31 combined team fouls. This is fun to watch. Koenig back in at 5:43. FTs won the game for Wisconsin on Thursday. They're killing the Badgers today. Donte DiVincenzo is a beast. He now has 14 points, Nova up 57-50 with 5:16 left. DiVincenzo hits a bit 3 for Villanova and pushes the Wildcats' lead to 7. Timeout Wisconsin. Slipping away for #Badgers . Down 7 with 5:16 left. Badgers down five 57-52 with 5:00 to play. C'mon now, boys! Get a stop! UW showning some resiliency. Baskets by Hayes and Koenig have the #Badgers within 57-54 with 3:57 remaining. Koenig's first points of the second half cut the deficit to 57-54 with 4:24 remaining. Final media timeout. Nigel with a block that goes out of bounds, but possession will stay with Villanova. Timeout on the floor. Nigel Hayes with a block that goes out of bounds, but possession will stay with Villanova. Timeout on the floor. Hell of a game between #Badgers and Wildcats. Nova up 3 with ball and 3:57 left. #Badgers NOT done fighting. Impressive showing for Nigel... We've got a chance for a BIG finish--either way. Villanova is No. 2 nationally in FTs and UW is No. 327. Today: Wildcats 12 of 15, Badgers 6 of 14. Starters on the floor with <4:00 to play. Koenig! Tie game on the senior's 3-pointer from the corner. Koenig with a corner THREE to tie the game at 57. 3:11 left.